Bristol Show 2015: Ruark Audio unveils multi-room R2 system | What Hi-Fi? Ruark Audio has announced a multi-room upgrade for its R2 music system, which has gone on display for the first time at the Bristol Show 2015. The upgrade marks the first time Ruark has entered the multi-room audio market, and with it, the company hopes to serve up something a little different. According to Ruark, this new R2 multi-room function can be set-up and controlled directly from the system, something which it claims can’t be done on similar, rival systems. Other aspects of the new version are the same as the current model: handcrafted wood casing, metal panels and an OLED display on the front. Ruark’s intuitive RotoDial controller makes an appearance once again, a feature that allows users to control volume and to skip or repeat tracks. An iOS and Android app that will let users remotely control two more R2 units from anywhere within the network’s wireless range has also been confirmed as a future release. 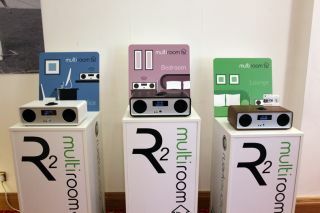 The new multi-room version of the R2 is available in Rich Walnut veneer and Soft White finishes for £400 from mid-April. Current owners of the MK3 R2 will be able to update their model via an online firmware upgrade.